To book Rachel for your special event, please click here or email . To view Rachel's belly dance performance showreel, please click here. To view stunning student performances, please click here. 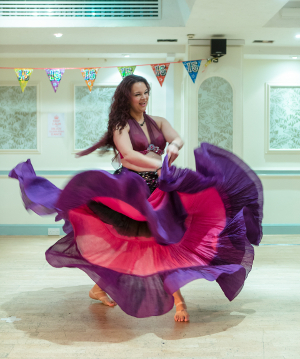 Catch Rachel performing and teaching at Dance around the Globe haflah and workhops, 14-16 Jun 2019, Oxford, presented by Mim’s Bellydance. Bellydance Heaven 2019 with our American-born star-spangled teacher, the UK expert & fairy godmother of Glastonbury Majma: Raheesha - Sun 29 Sep 2019, Twyford. Workshops TBA - save the date! Shimmytastic Showcase - Sat 24 Mar 2020, Twyford - evening event - save the date! Bellydance Heaven 2020 - a weekend intensive with international champion Bellydancer of the World: Queenie - Sat 5 & Sun 6 Sep 2020, Twyford. Workshops TBA - save the date! How would you like to learn a routine with Ozgen and then perform it WITH HIM on stage at a showcase afterwards? We are delighted to announce the Casbah Cabaret Deluxe edition! Helen Santa Maria and Rachel Bennett have brainstormed a super exciting event for you! This workshop is open level for improvers, intermediates, advanced and professionals. Ambitious beginners might be surprised at what they can achieve under Ozgen’s tuition. 4.00pm to 6.00p Showcase with afternoon tea and cake – optionally perform Ozgen’s routine and apply for a group or solo performance slot. You’ll enjoy a stunning performance from the bellydance maestro himself: Ozgen! Our spacious venue has an elevated stage, so you’ll enjoy a clear view of Ozgen, special dance sprung floors and free on-site parking. There’s a paying bar and we can’t wait to serve you complimentary tea and cake at our shimmering showcase. Advanced ticket sales only. Early bird ticket discounts run until end April 2019! Whole day ticket including 2-hour workshop, showcase, afternoon tea & cake - £45.50 until end April. Thereafter: £55.00. 2-hour workshop only - £35.50 until end April. Thereafter: £45.00. Showcase only with afternoon tea & cake - £12.50 until end April. Thereafter: £15.00. Children - £6.50. Under 5s free. Tickets are non-refundable and non-transferable, regardless of circumstances. Upon purchase, you will be opting in to our RBSB and SMBA newsletters, from which you can unsubscribe at any time. Q. "I love the sound of that! How do I sign up?!" A. Use the drop down box above to add all your desired workshop and showcase tickets to your shopping cart and check out. All sparkling performers require tickets. Be sure to mark yourself as "going" on the Facebook event and turn on notifications. That way you'll be one of the first to know when places are open later this year. Also, stay tuned to our newsletters. Mark your diary now! We'll be opening up performance slots for groups and soloists on 1st March. Slots are open to all dancers, though priority will be given to RBSB and SMBA & SMBO students. Stay tuned to our event page for deets on how to apply.